D3 Publiser introduced my family to the cartoon the Secret Saturdays. I can’t tell you how much we actually like it. It’s embarrassing , or at least in my case. I can’t speak for my husband daughter and son. The cast is awesome and graphics are great because they aren’t over the top like most cartoons today. It’s just a plain cartoon with a plot line from Supernatural. Cartoon Network sent me a review copy of The Secret Saturdays Volume 2 and a copy of The Marvelous Misadventures of FlapJack Volume 1.
Who are the Secret Saturdays? The Secret Saturdays are Mom Drew, Dad Doc, and Zack the kids with the power over the cryptids. They are not your normal family because they don’t sit down together for dinner, they bond over action packed adventures. They find out if they are tough enough to stop VV Argost and his evil plan to get the Kur Stone. Mattel will be creating the toys and D3 published the video game. The series follows the adventures of the Saturdays, a family of cryptozoologists that work to keep the truth about cryptids from getting out, in order to protect both the human race and the creatures themselves. The Saturdays travel the world searching for cryptids to study and battling twisted villains like the megalomaniac V.V. Argost. The series is influenced by the style of 60s-era Hanna-Barbara action series (such as Jonny Quest), and is combined with Jay Stephens’ own personal interest in cryptozoology. The series also airs on Teletoon in Canada. 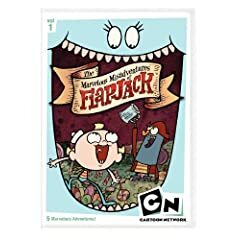 Flapjack is a young boy raised in a talking whale named Bubbie. Flapjack leads a peaceful life until the duo rescue a pirate by the name of Captain K’nuckles, who tells Flapjack of Candied Island. Inspired by the adventurous pirate, Flapjack, Captain K’nuckles, and Bubbie get into strange predicaments and "misadventures" in search of Candied Island and the coveted title of "Adventurer." The three spend most of their time in Stormalong Harbor, where they earn money, eat candy, and get into misadventures. Tell me what your favorite Saturday Morning Cartoon was growing up. My favorite was The Smurfs! I miss the old cartoons!! I’m subscribed to your blog!! My fave was Scooby Doo! And the Jetsons. Thanks for the giveaway! My fav cartoon growing up was the Smurfs! I loved Tom & Jerry. My favorite cartoon when I was little was Smurfs and The Get Along Gang! I always loved Rocky & Bullwinkle. The Smurfs was my favorite. When I was young — I say, WHEN I WAS YOUNG (that’s the problem with young’uns these days; they don’t know how to listen) — I was more than a little fond of Foghorn Leghorn. My kids love Flapjack. Jetson use to be my all time fave!!!!!! I used to live for Saturday mornings when I was little. Valley of the Dinosaurs was definitely a favorite. Thank you for the chance to win. I go way back and my favorite was Winky Dink. Please accept my entry. Thank you. My favorite cartoon was always Josie & the Pussycats! Although I also loved the Jetsons and Hong Kong Phooey! My favorite cartoon as a kid was Smurfs, when my children came along, I became addicted to The Wild Thornberrys, and now we are huge Wow Wow Wubbzy and Spongebob fans. You are never too old for cartoons (or Ratoons as my 5 yr old says). Jonny Quest was my favorite. I loved watching the Roadrunner and Bugs Bunny when I was a kid. My father and I grew up watching Tom and Jerry as well as Bugs Bunny. I’ll show my age here but I remember liking Porky Pig. Thanks for the wonderful giveaway. My favorite cartoon growing up was the Smurfs (who seem to be back in full force again!) I remember they used to come on TV (this was before cable) at 7:00 a.m. and I used to have to get myself up to see it… couldn’t get me to do that for school though! My favorite cartoon growing up was Rainbow bright. I used to watch JEM,loved that show! I used to love to watch Bugs Bunny & friends. The Bugs Bunny and Road Runner Show! I loved care bears growing up.Thanks! My favorite was The Smurfs. The Road Runner was my favorite.